“I am so sick of this _______ cat _______ and _______ all over the house! (You can fill in the blanks). I can’t take it anymore. If this doesn’t stop I’m leaving you. I’m not kidding, Chuck. You are going to come home and find me gone!” That was Friday afternoon. Earlier that week, my wife, Rose, ordered new furniture. 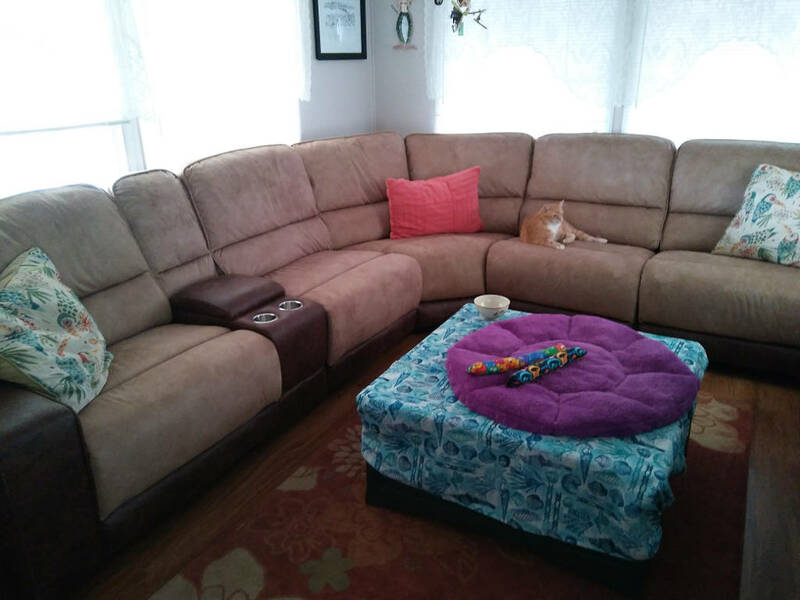 She never liked that sofa in the cat’s room and wanted to get rid of it. We really just bought it because it converted to a bed for company but we rarely have company. When we do have an overnight guest, it is usually Rose’s son, Nick, who prefers to sleep on the sofa unopened. 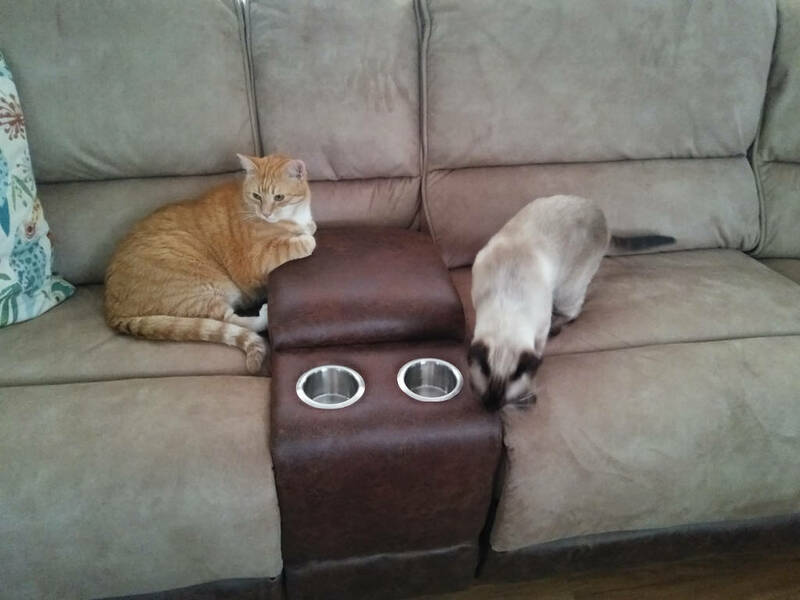 It is also uncomfortable and, most importantly, the introduction of that sofa two years ago was the start of Puck pooping outside the box. You might remember we found poop on the couch and blamed Chris (see here). I put the sofa on Craigslist for $100 but the woman that came out to buy it saw claw marks on the arm and didn’t want it. We had it covered since the first pooping incident and I did not realize the arm had little claw holes in it. When she left I relisted it for free and someone picked it up later that day. We brought the love seat from the living room and put it where the sofa was. I suggested covering it but Rose said that Puck never pooped or peed on it in the living room so it should be okay. The next morning Thursday, there was poop on our uncovered loveseat. Now we have it covered again so we can’t use it. We got rid of two of our three chairs Thursday by bringing them to the dumpster. 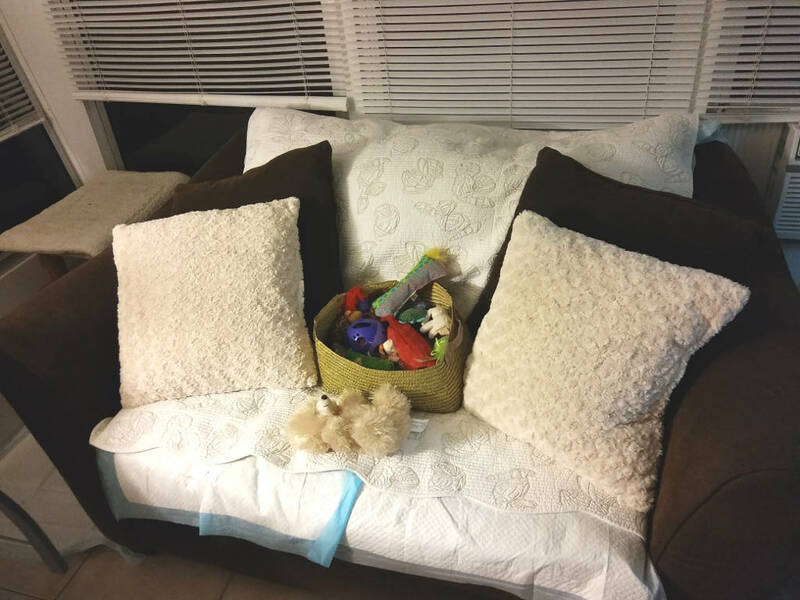 We then cleared everything out of the living room that we could to prepare for the Friday morning delivery of the sectional sofa that Rose bought. 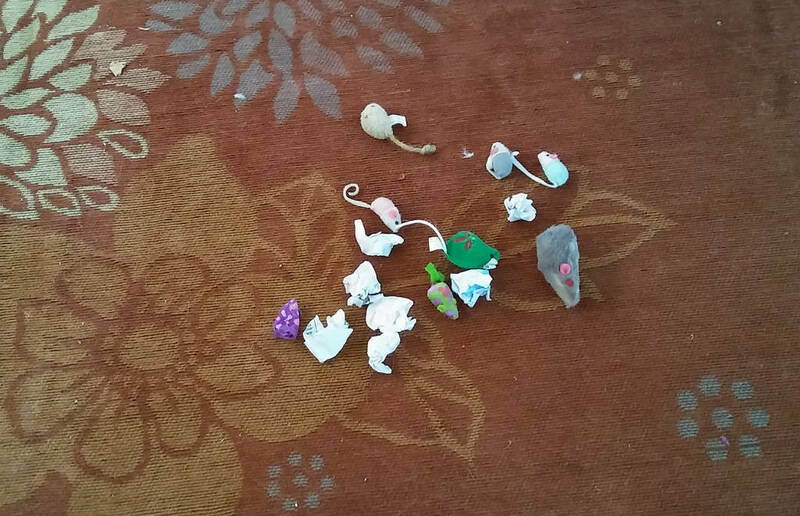 When I moved the coffee table I found a collection of mice and balls of paper that Floki lost there. The new sofa was delivered and set up by late morning. All the cats were interested in it, especially Chris. 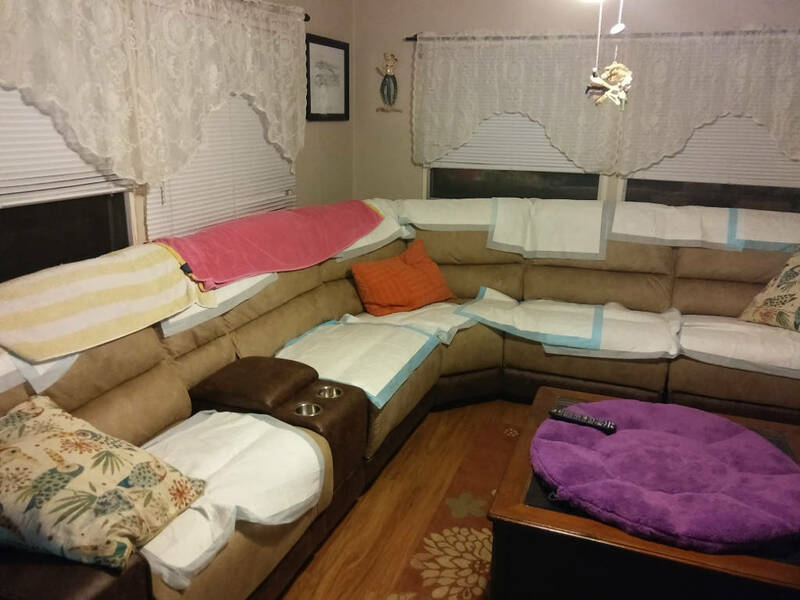 About four hours after the new furniture arrived, I noticed one of the cushions was wet. PUCK PEED ON IT. Please refer to the first paragraph for what happened next. I know this makes my wife seem insensitive but believe me, she is not. She is a very compassionate person and she loves our cats but she is also a very clean and organized person and having to deal with poop and pee on the floor almost every day goes against her nature. In addition, her nose is like a bloodhound. It is not an exaggeration to say her sense of smell is ten times greater than mine. I can walk into the house after a long day at work and not notice anything but to Rose, it is like walking into a sewer. Then there is the issue of Puck peeing on our brand new sofa before she even got a chance to relax and enjoy it for the first time. I totally understand her reaction but there was nothing I could say in Puck’s defense. I really thought I could solve his problem before now but it is way more difficult than I ever dreamed it would be. 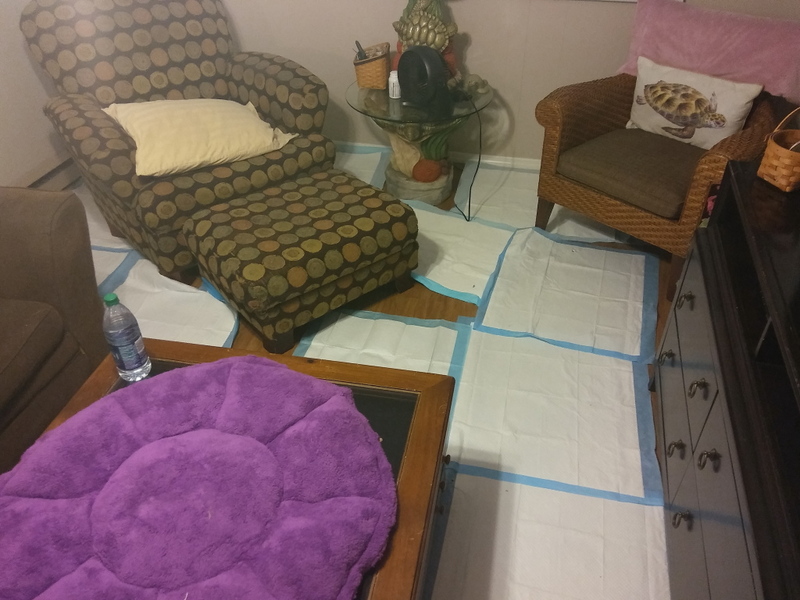 She did get over her anger and I covered the sofa in pee pads until we could figure something out. Of course, that is not a long-term solution. We left the next morning to spend a couple of days in St. Augustine for our eighteenth anniversary. We had a good time and my marriage was back on track. Our cat sitter, Lynn, reported a few pooping “accidents” while we were away but she did not have to clean up pee, which was encouraging. The sofa also survived our absence without being soiled. I do believe I have discovered the cause, or at least a contributing factor, to Puck’s problem. I think Frankie is stressing him out. Frankie has been “marking” the litter boxes. That has caused Chris to mark the litter boxes too. Sometimes they will pee up the side of the box and over the top. Last week Rose smelled urine in the house and was convinced Puck peed somewhere but I found the underside of one of the litter boxes was saturated with urine. This has been going on for longer than Puck’s problem but I think it happens more often now. If that is not enough, Frankie and Puck fight quite often. Sometimes I come home and see large chunks of black fur on the floor. Puck is not afraid of Frankie and has no problem fighting back but I am sure it doesn’t help his stress level. Puck also fights with Floki but it is not the same kind of fighting. The reality is that every cat fights with every other cat except for Chris and Puck. They never fight. During the last week or so we locked Puck in our bedroom three times. 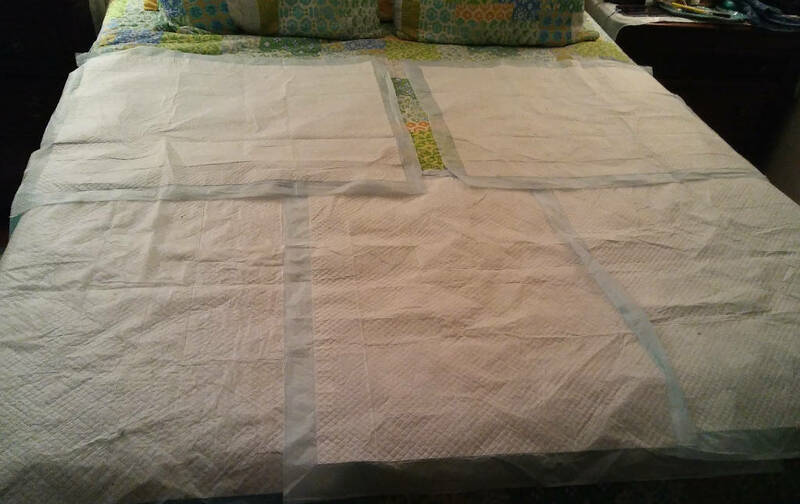 I put pee pads on our bed and I put food, water and a litter box in the room. I also made sure I wiped down the sides of the box so he wouldn’t smell Frankie. The first day I found pee in the box but the next two times he went all day without peeing or pooping and then he peed and pooped on the floor after I let him out. I’m going to keep trying because I want him to get used to using the box again but if this doesn’t work I don’t know how long I can stay married. The encouraging thing is that since the incident, Puck has pooped but not peed on the floor and he has not done anything bad on the sofa. What is amazing is that it has now been more than five and a half days since Puck peed outside the box. I don’t know. Maybe Rose scared him straight. I hope so. 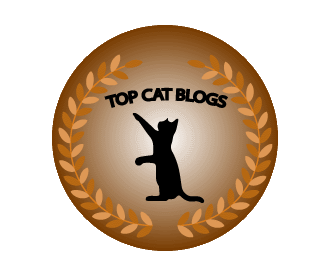 This entry was posted in Uncategorized and tagged cat, litter box issue, mrrage, new furniture, pee on October 19, 2017 by Charles Huss.